Together we can give a promise and a future to many people who don't have the one thing they need to survive, water. 09/17/14 Anonymous $100.00 Being blessed with an abundance I forget that giving water is giving life! 09/12/14 Ben Labrie $100.00 Ben Labrie loves water! 09/12/14 Nicholas Montminy $46.00 Wake up everyday knowing you are making a difference in every moment in the lives of so many! 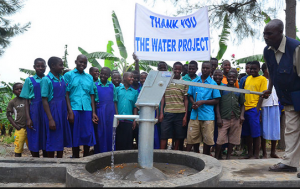 09/12/14 Sara Agren $46.00 Over the last 12 months, over 800 groups all around the U.S and Canada signed up for "The Water Challenge" to fund water projects at schools and community centers in Africa. 09/11/14 Jess Agren $100.00 500.